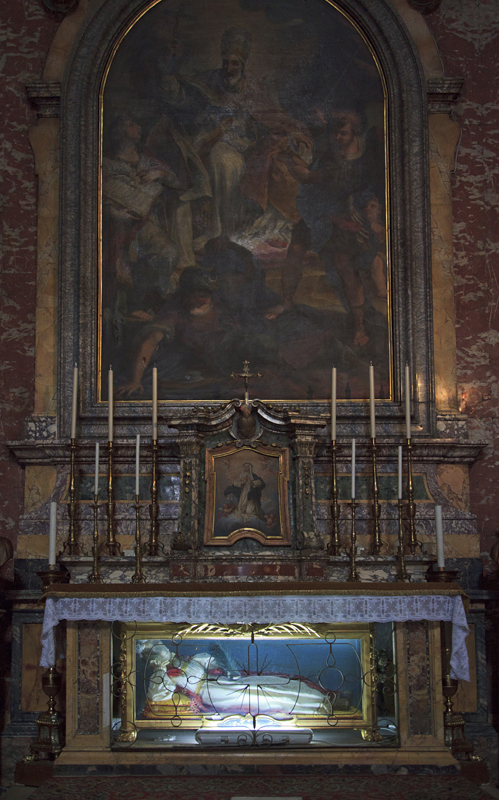 A few of the most wonderful things I saw on my recent trip to Italy with Evan Michelson were the two saints seen above, both to be found in Rome, the last stop on our tour. 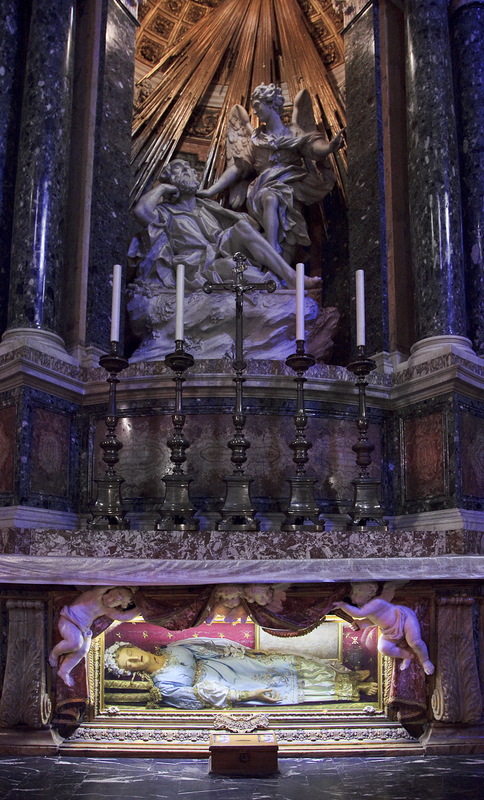 The first is Saint Vittoria, or Victoria, on view in the church of Santa Maria della Vittoria, directly across from that Bernini's masterwork The Ecstasy of Saint Theresa (top 3); The second is a wonderful reliquary preparation of "S. Wittoria, Martire" fantastically posed and costumed, and showcased in a gold and glass coffin in the Basilica of Saint Mary Sopra Minerva (bottom 2 images). I am not sure if these two representations might possibly depict the same saint (Wittoria being an alternate/old fashioned spelling for Vittoria? ), or two separate ones. I have been able to find nothing official on the Internet about a Saint Wittoria, though Vittoria seems to be a depiction of the Roman Saint Victoria, "virgin and martyr of the catacombs." 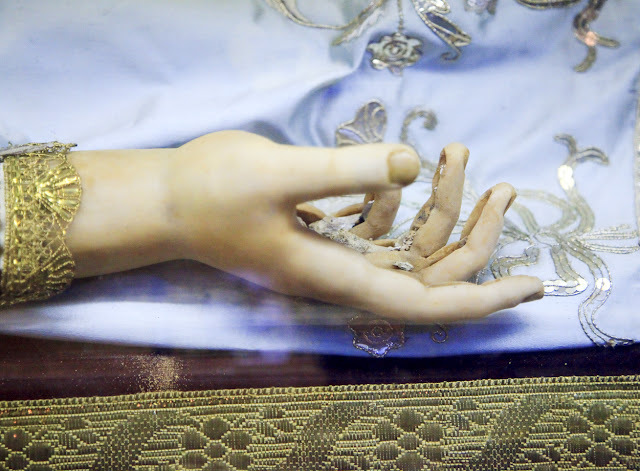 I also am not sure if there are human bones embedded in the wax of St. Victoria, though Marina Warner asserts this is the case in her wonderful book Phantasmagoria, and the close-up photo above of her hand seems to support this assertion. Regardless of the problems with research, I hope you agree with me that these are astoundingly amazing and fascinating artifacts. These Saints--and many more, both sacred and profane--will be featured in my upcoming exhibition at Viktor Wynde's Fine Arts in London this September. They will also feature in a book I am working on with friend, Morbid Anatomy Library Scholar in Residence and co-star of The Science Channel's "Oddities" Evan Michelson. Stay tuned for more on that! Fascinating post. I've just seen a documentary that claims the first one is a real body rather than a waxwork, I don't see how it could be though. Cheryl: I would love the name of the documentary; thanks! JE, I think I've just seen the same documentary, which indecently brought me to this blog. It's called: 'History of Rome' by Simon Sebag Montefiore. The second episode, from BBC4. . 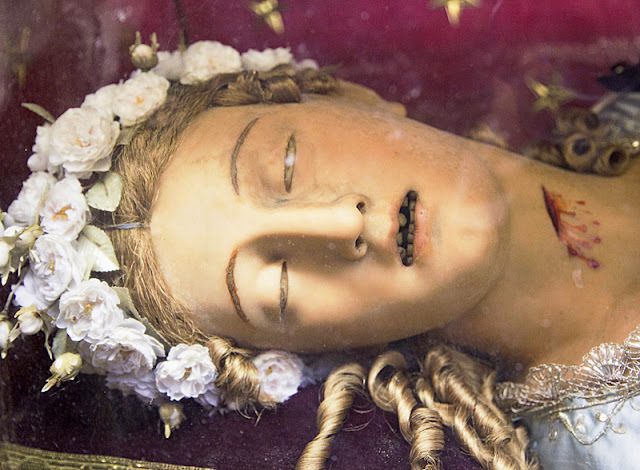 Apparently she was mummified 2000 years or so ago, after being martyred in a Christian pogrom by a Pagan Roman emperor. Thanks, Josh. I will try to find a way to watch this! The documentary was fascinating, and it inspired me to search more about this young lady's life also, which is how I found your blog. According to Mr Montefiore's narritive, it is actually the body of Saint Vittoria herself. At first I wasn't sure I believed it - how they know this is not explained, but I suppose if they celebrated an individual in life this much they wouldn't go to the trouble of preserving somebody else's body on public display in a glass case! 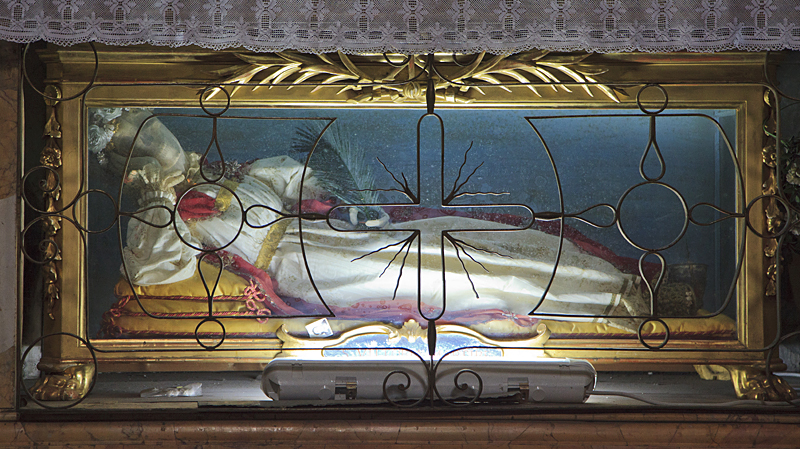 Watching the BBC Documentary too, Saint Victoria resembles our Santa Inocencia in Guadalajara, Mexico. A First-communion child martyr and I believe she's also encased in wax, google her name and her pictures will come up.